It is not important what the instrument is made of. Some brass instruments are really made of wood, but are still called brass instruments, like the serpent. Other instruments are made of brass but do not work like this, like the saxophone. 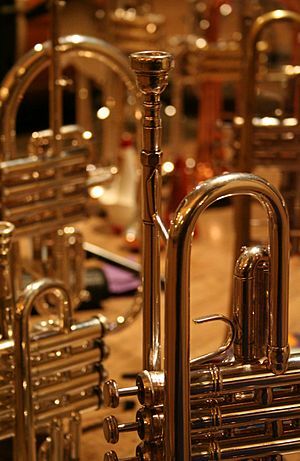 They are not called brass instruments although they are made of brass. A tenor horn (alto horn) in Eb, baritone horn in Bb, and euphonium in Bb. Brass instrument Facts for Kids. Kiddle Encyclopedia.